If you remember, after my research quest for the perfect meringue pie without practice the first try was delicious the second try perfect. You can make it perfectly on the first try and wow everyone by following the recipe my research led me to create by following the link above. Something was still missing though: The lemon custard under the meringue was far from perfect. It was soft and jiggly, somewhat watery at the top, and mouth puckering without being sweet enough. I’m sorry to report that I still haven’t hit perfection in the lemon custard department. What I can offer is a breakthrough which I hope will eventually lead to a solution. I was thinking about what the perfect texture would be, and it hit me: pots de crème! Chocolate pots de crème is a thick french custard traditionally served in small ramekins, halfway between pudding and ganache in texture. It’s pronounced “poe de crem,” because the French don’t believe in voicing as many letters as we English speakers generally do. Pots de crème have the perfect consistency for placing under meringue. They are dense where meringue is fluffy, but equally smooth. Naturally, I had to put this theory to the test. My research taught me that an egg-thickened custard sets at 175 degrees Fahrenheit. It is at this temperature that the proteins in the egg yolk unwind to embrace the milk and create the lovely gelled texture we’re looking for. Unfortunately, at 180 degrees, this work is undone as the protein strings break down and clump together into little globs that don’t hold anything. It’s a touchy business, and one that is difficult to capture in the oven. 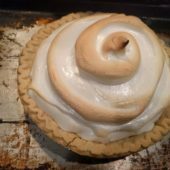 The Cook’s Illustrated recipe takes advantage of this knowledge to make the entire dish on the stove so that it is a simple matter of using the candy thermometer I rely on to make my meringue. Since this recipe already existed, I did not feel the need to reinvent it. I made the Cooks Illustrated recipe published in the Seattle Times and then topped it with a meringue using my recipe. For fun, I made it as personal crustless pies this time around. 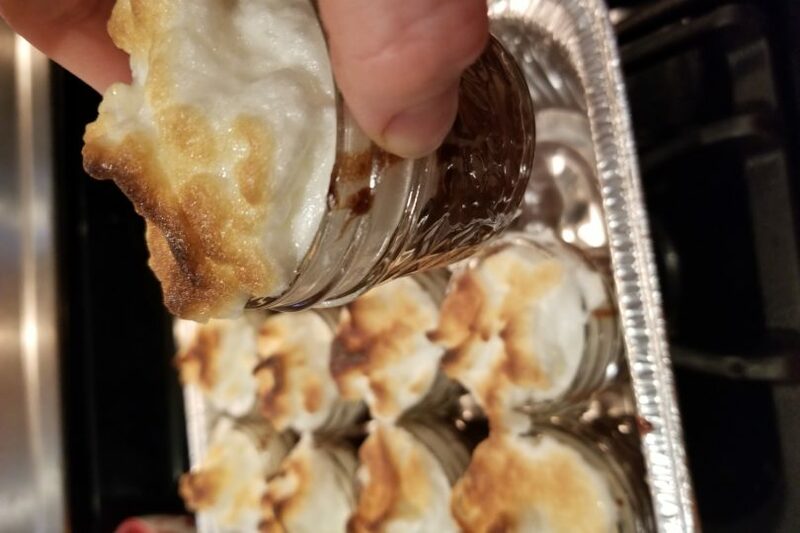 One recipe’s worth each of the pots de crème and the meringue made 12 servings. So there you have it, that was my breakthrough. Stay tuned for the eventual lemon custard mimicking the texture of pots de crème. I don’t know much about it yet, but I do know that it will involve heating the custard to 175 degrees and no hotter!